Want to find out how effective your portal is in converting visitors into players? A simple and easy way is to do a conversion analysis. 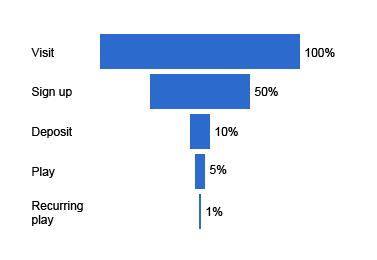 In the example above we see that we only get 30% to register and only get 50% of them to deposit money. So this gaming portal should start by focusing on making it easy for the player to sign up and deposit money. If we could increase the number of registrations by 100% then the conversion rate of actual real players would be increased as well. 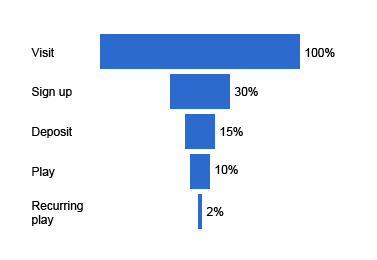 In the second example above 50% register but only 20% of them deposit money. So here the focus should be on increasing the number of users depositing money. So start use data to help focus on the right things!